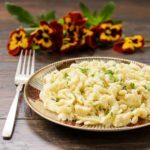 A recipe for spaetzle (spätzle), homemade German egg noodles made with eggs, flour, salt, and water. It is a great side dish and an easy pasta to make using a spaetzle press. Get a large pot of water with a strainer insert to a boil. Rub a thin coat of oil to the inside of a spaetzle press to prevent dough from sticking. Crack the eggs into a medium bowl and whisk thoroughly. Add the flour, salt, and water. Use a wooden spoon to mix together the ingredients. Continue to mix the ingredients from bottom up in a circular pattern to incorporate air into the mixture for about 4 minutes. Fill the spaetzle press about two-thirds full of dough. Press it over the boiling water, stopping when the dough is about an inch long. Use a knife to cut the dough from the press. Stir after each cutting. Cook the spaetzle for two minutes. It will be floating on the top. Lift the strainer insert out of the water and drain the spaetzle. Pour the cooked spaetzle into a dish. Add a little butter, about a teaspoon or two, and stir to melt the butter to keep the spaetzle from sticking. Repeat cooking process in batches with remaining dough. Serve immediately or store in a sealed container in the refrigerator or freeze. Spaetzle can be re-heated in the microwave (defrost first). To re-heat: Microwave on high at 30 second intervals until warm.